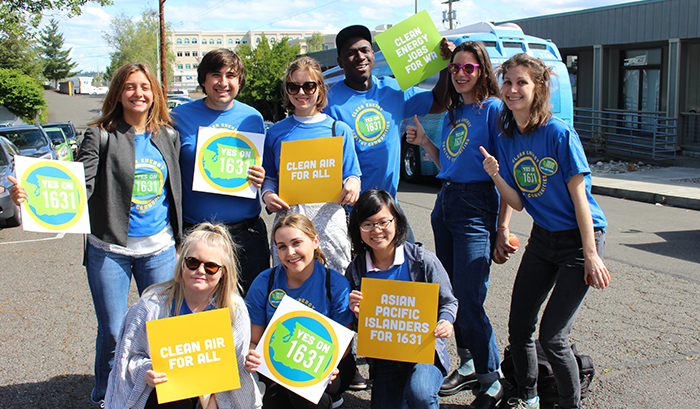 Washington Conservation Voters has endorsed Initiative 1631 because it will protect Washington’s land, air, and water and move us towards a strong, healthy clean energy economy. Over 400 organizations, and businesses across the state support I-1631 representing working families, communities of color, environmental advocates, health professionals, businesses, and faith organizations. Join us at one of our phonebanks, become a digital organizer, or volunteer for a canvassing shift to talk to people in your community and spread the word! Sign up here or email Field Organizer Nathan McCurtain, nathan@wcvoters.org with your volunteer questions.